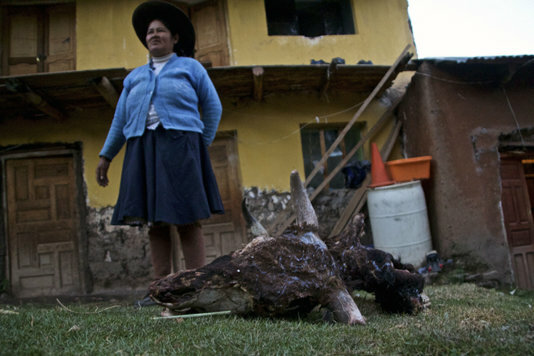 They were made promises of employment and development with the building of a huge mine, but the indigenous peasants in the Andean region of Cotabambas have so far got damaged crops, dead livestock, a rising cost of living and, worst of all, dead protestors. Ebert Buendía longs for the life they had in his village, Pisaccasa, one kilometer from Las Bambas mine, in the South of Peru. He thinks that the pit has caused too many conflicts and very few benefits for the zone. “We used to live off our lands quietly, peacefully. Nobody disturbed us,” he says. 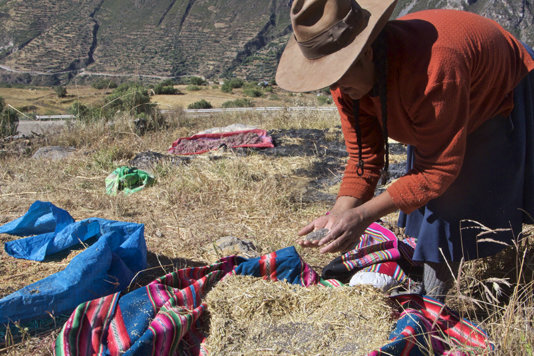 Cotabamba’s population, quechua (the ancient language used by the incas) speakers, used to consume the outcome of their crops (potatoes, corn, quinoa, legumes…). Occasionally they sold a cow or a sheep to buy some staples they couldn’t produce and some months of every year the men emigrated to cities to get a paid job. Their incomes were very low and, neglected by the State, they had very poor public services including health, education and infrastructure. So they welcomed with hope the arrival of a huge mining project in the region that, when fully operating, extracts 450,000 tons of copper a year, and almost twice that in other minerals (like zinc, molybdenum and silver). The company that owns the mine, at the beginning the Swiss Xtrata, promised them development for the region, employment opportunities in the pit and a low environmental impact, as it would take their raw production away through a pipeline. “We were convinced that a complete change, a great advance was coming for Cotabambas,” Ebert recalls. That’s why the allowed the mine to widen the unpaved road that passes through the region, so they could use it during the mine construction period to bring the required equipment and supplies, according to the temporary contract signed in 2010. During the construction, things ran relatively smoothly. The mining company hired a lot of local labour force and tried to keep the villagers happy with some aid programs. But once the mine was finished and the extraction began, it brought qualified workers from outside. The locals were scarcely hired and, if they were, it was mostly for the lesser paid jobs: drivers, security guards and cleaning staff. “Here we don’t have any chance to work for the company. They just bring people from other parts of Peru. If we cannot get a job there, where are we going to get it?” Ebert asks. Besides, “the investment in the village by the company has been zero”, he says. The firm will pay a mining canon for the right to extract minerals and a part of that will be managed directly by the municipalities, but many years may pass before that. According to the Peruvian laws, which are very friendly to foreign investment, it has a grace period to regain its investment and, in any case, it won’t pay anything until at least 2022. Contrary to the promises made, “we are poorer than before”, Ebert claims. This is because “the mining company has made the cost of living increase. Things cost double what they did before it arrived. Where is the peasant going to get that money if he only lives off his potatoes?”, he wonders. Mining activity is the backbone of the Peruvian economy, but the pattern of the projects in this activity is always the same. 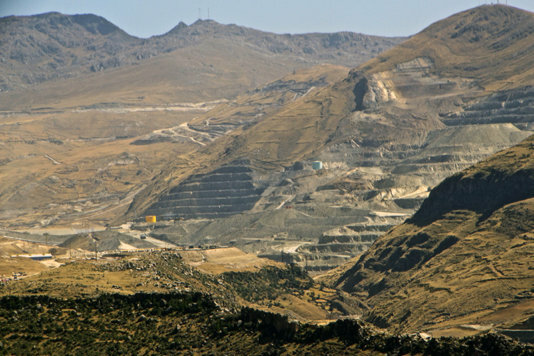 Most of the mines are located in Andean zones, very poor and underdeveloped, and they generate wealth for the country’s economy but they leave only environmental damage and social conflicts in their midst. The mining concession changed hands in 2014 and was bought by the Chinese company MMG. The new owner changed the terms of the project with the government's approval but without consulting the local population. On one hand, it decided not to make a pipeline and to take away the raw minerals in trucks by road. On the other hand, it built a processing plant for molybdenum, initially planned in another region. “The molybdenum doesn’t affect human health, but it has a very strong stink, very annoying," points out Ana Leyva, director of Cooperacción, a sustainable development NGO that has been working for the Cotabambas’ peasant population since the beginning of the project. “In addition to that, this mineral has an effect on the animals, as it causes them an illness, although this hasn’t been very investigated yet," admits Leyva, who regrets the lack of information from the company and the government. But the main problem so far has been the use of the unpaved road to transport the minerals, as the big trucks that carry them raise clouds of dust that are undermining the crops and the pastures, and causing respiratory health problems, mainly for those who are the most vulnerable: children and the elderly. “The field where our cattle graze is covered by the dust. By consuming pasture with dust, the livestock is starting to die. And nobody accepts responsibility for it,” says Juan Carlos Huilca, another neighbour of Pisaccasa. The crops are also affected by the dust and “they no longer produce as they used to do,” he adds. “In this area there’s no life anymore”. Since Las Bambas became operational at the beginning of this year, around 250 trucks take the minerals away daily and come back to the mine to be charged again. In addition to the dust, the convoys - with up to 30 vehicles - circulate day and night, on a road that passes through several little villages, causing noise, vibrations and the risk of accidents and spills. In Pisaccasa, trucks cross through the middle of the town and it’s causing houses to crack, disrupting sleep and the tranquility of locals, filling their homes, the school and the health center with dust. The unilateral changes in the project by the company have triggered the anger of the Cotabambas population. In September last year they protested against the mine and paralysed activities in the mining zone. The Peruvian government, then lead by the unpopular president Ollanta Humala (whose term ended last July) sent hundred of policemen to placate the revolt. The result was three peasants dead and dozens injured. The local population has since avoided more confrontations and have been trying for months to reach agreements with the Chinese company in a dialogue process along with governmental participation, but it has taken too long to produce any results. 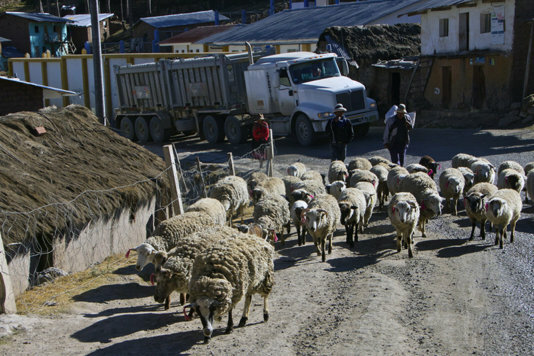 At the beginning of October, MMG and the Peruvian government agreed to pave the road to halt the dust problem. But still a lot of peasants don't agree at all with the use of the road. On 14th October a new protest resulted in clashes with the police and another man was shot dead.